Don't miss this beautiful used 61' Viking yacht for sale! : Atlantic Yacht & Ship, Inc.
Don’t miss this beautiful used 61′ Viking yacht for sale! Ed Biggie reminds us that he has listed a great deal on a used 61′ Viking yacht. Known as “SEA SEA RIDER,” this 61′ Viking yacht is turn-key and ready to go! In the first place, you will be welcomed aboard this spectacular convertible yacht that is a gorgeous fishing machine. In fact, from bow to stern she represents nearly four decades of yacht building experience. This means her state-of-the-art engineering, performance, and luxury are second to none. Fast and agile, her sharp, raked ride lets her ignore head seas! As can be seen, this 61′ Viking has descended from the popular SS Viking Convertible model. Moreover, part of this enhancement allowed for her sharper entry to oncoming seas. This also allowed for an improved ride in general. Not to mention that this yacht only has 900 original hours. That means she is barely broken in and ready to cruise! Conveniently located in Florida, she is easy to see. 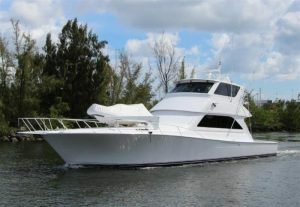 For more information on this beautiful used 61′ Viking yacht for sale be sure to contact Ed Biggie today!